What do you do, when an arts association cancels your exhibition because they find it too political? And when a cultural centre asks you to change your exhibition proposal to hide the true message so that it might stand a chance of being shown? You make sure it gets shown anyway, in an unbiased space. 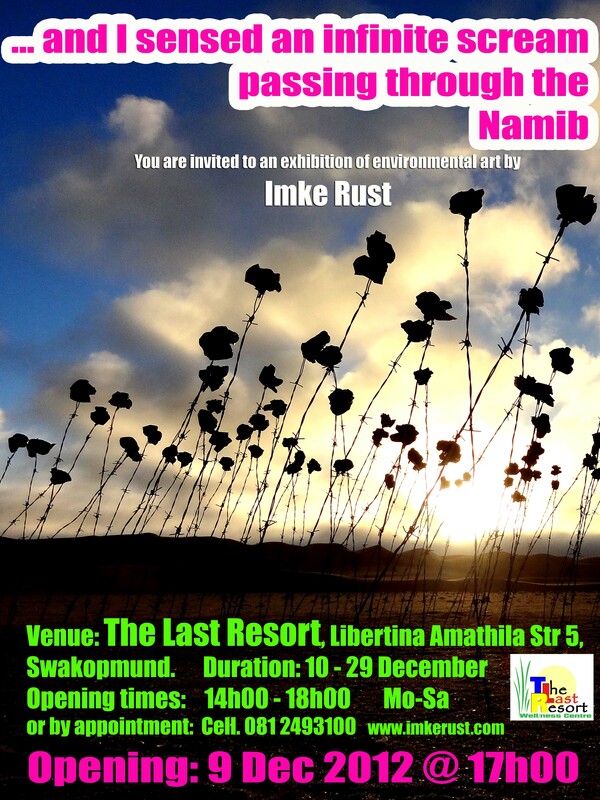 And so Imke Rust’s latest solo exhibition, entitled ‘… and I sensed an infinite scream passing through the Namib’ will open at “The Last Resort Wellness Centre” in Libertina Amathila Ave 5, Swakopmund (opposite of Hotel Pension A la Mer) on the 9th of December at 17h00. It can be viewed thereafter till the 29th of December, between 14h00 and 18h00, Mondays till Saturdays. In this environmental art exhibition Imke Rust, who grew up in Swakopmund and is still closely connected to it, addresses the current debates and happenings concerning the plans for increased mining and industrial activities in the coastal area. In her work she uses a variety of media and approaches to highlight the concerns of the general public and to search for alternative solutions in the environmental conflict. While she is painting a gloomy picture of possible disastrous long-term effects of the current developments, she also reminds people of their responsibility to look after their land and that they have the power to make changes towards a better future. Once more, Imke Rust has produced a powerful body of work, exploring and openly questioning social and political controversial issues. Central to the exhibition are temporary land art works that the artist has installed in the Namib Desert. At the exhibition these installations and interventions will be presented through photographic and video documentation. She evocatively combines natural and man-made materials such as thorns, salt, dung, rubbish bags, barbed wire and videos in her captivating artworks. She even got complete strangers involved in a documented art action for the environment on the jetty. The artist neither preaches nor dictates what the viewer’s stance should be. Instead the exhibition draws you in and compels you to engage and consider the complexities of the debate. It is an empowering experience and should definitely not be missed. A small part of the exhibition has already been shown in Berlin earlier this year, where it was received with great interest. Intriguingly the Swakopmund Arts Association has cancelled Rust’s booking of the Woermann Gallery on the premises that the “impertinent and unscientific public debate against the economically important uranium mining industry […] is politically charged“.